Michael Avenatti and Sasha Dube of Peterborough pose for a selfie at the Democratic Picnic in Greenfield, N.H. 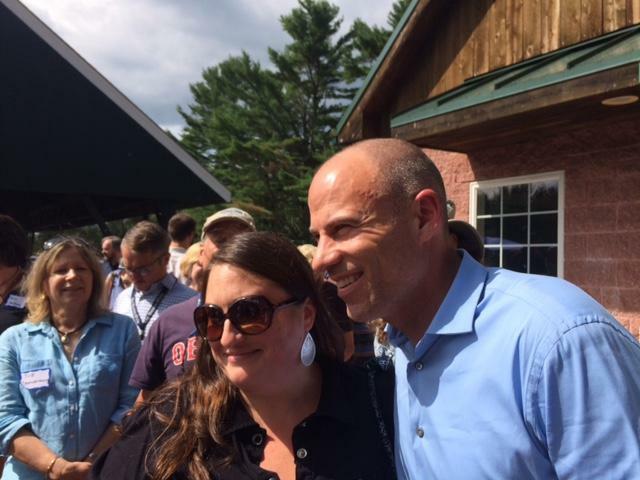 This was Michael Avenatti first visit to New Hampshire as a could-be presidential candidate. But when he showed up in rural Greenfield, in full L.A. trial lawyer at rest regalia - wearing Prada jeans, Louis Vuitton belt, form-fitting french blue shirt - it was clear his cable news ubiquity had paid off. Sasha Dube of Peterborough was one of a steady stream of voters gunning for a selfie. “My 10-year-old daughter is not here with me and she is acutally bummed. She's seen you on the View. Thank you so much!" 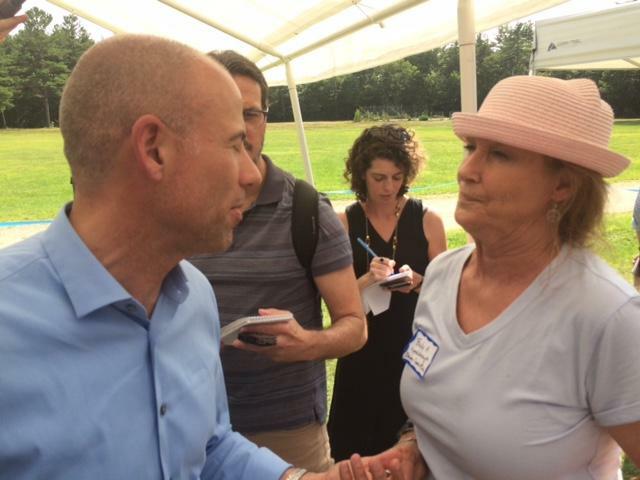 The gratitude many picnic goers felt toward Avenatti was palpable. State Democratic Chairman Ray Buckley roared like a carnival barker as he introduced Avenatti to the cheering crowd. When Avenatti spoke, his bottom line wasn’t much different. But he opened by acknowledging the obvious, that being in New Hampshire considering a presidential run is a bit weird. Yet Avenatti did try to seem normal. He talked about mowing lawns and shoveling snow during his childhood in Missouri. Avenatti also stressed that politics aren’t new to him. He told the crowd that in his twenties, he worked 130 Democratic campaigns in states across the country. But he says the Trump presidency, and his experience representing Stormy Daniels, galvanized him. And convinced him that to defeat this president, Democrats must reject any pretense of turning the other cheek. 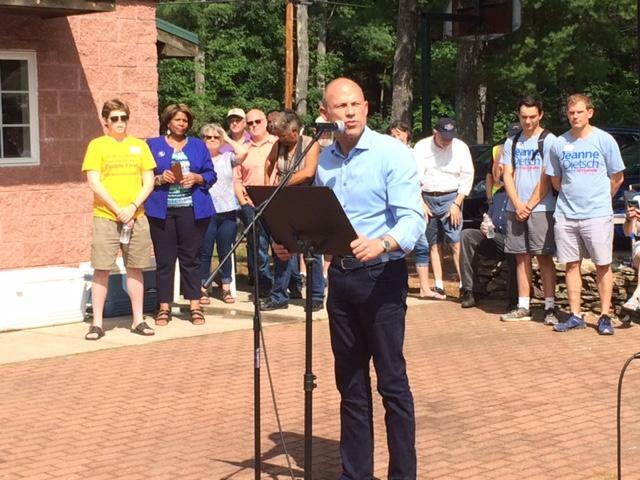 Michael Avenatti speaks to Democrats at the Greenfield picnic. For plenty in the crowd, Avenatti’s call to arms was more than welcome. Suzanne O’Brien of Sharon says the country needs Avenatti to run for President. Suzanne O'Brien says it would be a "breath of fresh air" if Avenatti runs for President. Avenatti himself tends to offer a more contemporary rationale for a potential candidacy. He says Democrats mostly need a nominee capable of doing one thing: pounding Donald Trump in a campaign that Avenatti says will be a street fight. "And I believe that this is all about match-ups. So if the Democratic Party proceeds to nominate the person who would be the best president that would be a mistake. Because we had that person back in 2016." Michael Avenatti says he intends to stay busy right through Election Day. And as he weighs his own political future, his discernment process will include travel, to Iowa on Wednesday, then to Chicago. Later, he’ll head to California and Ohio. The immediate goal, he says, is raise money for Democrats. Becky Hudson of Lyndeborough volunteered at the picnic. She says Avenatti showing up did benefit local Democrats financially, and she agreed with much of what Avenatti had to say. But she’s skeptical of his presidential ambitions, and says it will take plenty of convincing before she’s persuaded that Michael Avenatti is the antidote for what Donald Trump has done to the country’s politics. 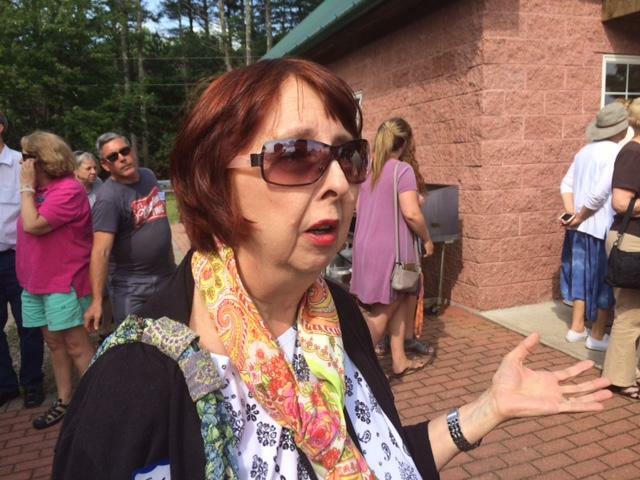 Becky Hudson of Lyndeborough, liked what she heard from Michael Avenatti, but remains skeptical, "I think the reality show needs to end. This is peoples' life, not a game." "I think the reality show needs to end. This is peoples' life. Not a game. I think he needs experience. You know maybe in six years." Michael Avenatti may be working on a faster timetable. He says he’ll be back in New Hampshire next month. Michael Avenatti, the lawyer for "Stormy Daniels," will appear at a Democratic Party picnic this weekend in New Hampshire. Michael Avenatti says he's considering a 2020 presidential run. He already visited Iowa and on Sunday he'll speak at the Hillsborough County Democrats Summer Picnic in Greenfield. Roger Lessard leads the local Democratic committee there. He says the Avenatti visit came together quickly. "We had not anticipated having anyone of national note appearing at the picnic and this just sort of fell into our lap." A former state Senate staffer told investigators that sexual comments “just roll off the tip of [the] tongue" of Republican State Senator and congressional candidate Andy Sanborn. That’s according to transcripts released by the Attorney General’s office late Friday. A debate between two Republicans running in the state's 1st Congressional District ended before it began Thursday night in Concord. It was supposed to feature state Sen. Andy Sanborn and Eddie Edwards. But Edwards bowed out a day earlier, after refusing to sign a pledge from the New Hampshire GOP that he’d support the party’s nominee. And just like that, it was primary season again in New Hampshire on Tuesday. But does it really ever end? Two past (and potentially present) presidential hopefuls, Martin O’Malley and John Kasich, made their way through the first-in-the-nation primary state Tuesday.